Wyandotte County – Page 2024 – Welcome to Wyandotte Daily! The healthiest and not-so-healthy counties in Kansas were discussed at a Kansas Health Institute meeting Monday at Sporting Park in Kansas City, Kan.
Johnson County was in the top five counties in the county health rankings in the state, while Wyandotte County was 96th out of about 100 counties. Representatives of three Kansas counties talked about how they used the health rankings information to improve health efforts in their communities. 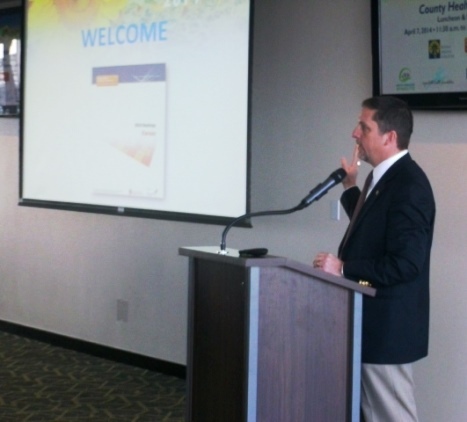 At the meeting, Unified Government Mayor Mark Holland shared his goals on how Wyandotte County can be a healthier county. Increasing the bike trails and encouraging others to eat healthier are a few of these goals. 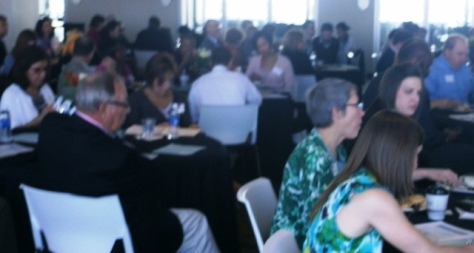 A panel discussion addressed methods of how to solve health problems in individual counties. More than 250 people attended this meeting. After a 30 percent chance of showers before 11 a.m. Tuesday, the weather will become mostly sunny. s high will be near 58, according to the National Weather Service. Temperatures were 48 degrees at 8 a.m.
A north-northwest wind will be from 10 to 17 mph, with gusts as high as 25 mph. New precipitation will be less than a tenth of an inch. Tonight, the forecast calls for mostly clear skies, with a low of 37. Winds may gust up to 18 mph. On Wednesday, look for sunny skies again, with a high near 74. A south-southwest wind will be from 5 to 10 mph, increasing to 13 to 18 mph in the afternoon. Winds may gust as high as 28 mph. Sporting Kansas City tonight presented a proposal for futsal courts all over Wyandotte County. 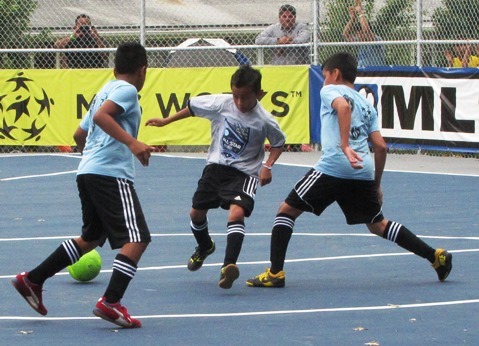 Instead of building three youth soccer fields as called for in an earlier agreement with the Unified Government, the MLS soccer team in Kansas City, Kan., has proposed converting eight existing tennis courts into futsal courts. Futsal is a form of soccer played on a smaller hard-surfaced court, and is very popular as a youth sport in other countries. When the project is completed, it would bring the number of futsal courts here to 10, including the two courts at Wyandotte High School that went on display during the MLS All-Star week here last summer. The proposal from Sporting Kansas City was worked out in negotiations between the soccer team and the Unified Government Parks and Recreation Department, according to information presented at the UG Economic Development Standing Committee meeting tonight. Greg Cotton, chief of staff for Sporting Kansas City, said this futsal project not only fits in with the Healthy Communities goal, it also gives Sporting and its partners in this project the chance to join together in the project. The partners in the project, besides Sporting KC, include the U.S. Soccer Federation, U.S. Youth Futsal, Heartland Soccer Association, and Padrino Premier Soccer League. The partners will come together to offer programs with the futsal courts, including league play, district tournaments and a championship tournament to be held here, he said. There are Saturday instructional youth clinics planned. Also planned is the U.S. Youth Futsal Youth Academy, an invitation-only group for high-performing youth in the community. There also will be free play time on the courts. “The goal is to encourage a healthy lifestyle for our youth in safe community parks so that the kids can play after school,” said David Ficklin, vice president of development at Sporting KC. Many children won’t need a ride to the fields complex to play soccer. Some proposed locations are on the bus line, while others are in the middle of neighborhoods. Sporting KC introduced futsal courts to Wyandotte County last July just before the MLS All-Star game in Kansas City, Kan. The new futsal courts at Wyandotte County were an MLS community service project. The kids in the neighborhood have really taken good care of the courts, he added. Kelli Mather, chief financial officer for the Kansas City, Kan., Public Schools, said the Wyandotte High futsal courts are used constantly by the physical education class, the soccer team, and the community children. There have been no problems at the courts, she added. Alec Lemmon, a coach of a youth soccer team called Toca City, said that the team trains at the Wyandotte High School futsal courts every week, including the winter, and it’s busy every night. “Soccer is the one thing in this community that is a common activity, it’s a shared thing across the diversity of the community,” he said. The proposed locations of the eight futsal courts, which are subject to change, are Bethany Park, Clopper Field, Highland Park, Klamm Park, Stony Point Park, Welborn Park, Westheight Park and Wyandotte County Lake Park. UG officials noted that there had been some difficulty in the past in deciding where to put three soccer fields in Wyandotte County. While the proposal was for one futsal court in each commission district, Commissioner Jim Walters asked that the exact locations of the futsal courts not be set in stone yet, but continue to be discussed between the UG and Sporting KC. He said that some commissioners believed that most of the fields should be in the more urban portions of the county. UG Administrator Doug Bach said that six of the eight courts would probably fall within the geographic boundary of being close to or east of I-635 in the urban area. David Alvey, a Board of Public Utilities member who is also a member of the Standing Committee, pointed out that there are pockets of low-income areas throughout the county, not just east of I-635. Commissioner Gayle Townsend said some of her constituents were concerned about the tennis courts at Klamm Park. However, Bob Roddy, director of public works, said that in Klamm Park, there are six tennis courts, and one is proposed to be converted to futsal, leaving five for tennis. He said the UG staff examined the parks to find where there were underutilized tennis courts. Townsend suggested having some meetings for the public to attend, hear the proposal and express their opinions. Cotton said they would be willing to work with each commissioner to select the best park location in each district. However, because of the cost of $100,000 or more to build a new futsal court, they are looking at converting existing paved areas such as tennis courts. After it comes back to the Standing Committee with more details set, the futsal proposal will go to a Unified Government Commission meeting at a later date for final approval.